There was already twice as much retail/restaurant in existence than the average U.S. American could sustain… before the economy crashed. So, besides going out of business, what is one way restaurants are surviving, and thriving? According to this article in the Wall Street Journal, think of how people are beginning to favor the connectedness of cities over the isolation of suburbia. Thus, rather than $50 entrees with white tablecloths with maximum distance from other diners (ie big homes on big lots with expensive cars), restaurant owners are favoring more lounge type seating with a bar that fosters a more festive atmosphere, offering smaller meals at lower prices, and adding live music – think piazzas and outdoor dining scenes. Think restaurant patrons won’t like the more community-oriented nature rather than sitting at more private tables? 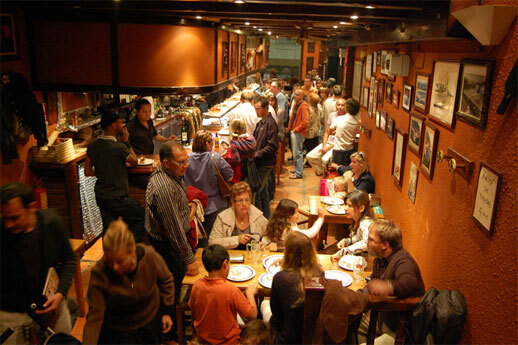 (see photo of a tapas restaurant in Barcelona above). Think again, “Beyond thrift, there is a social component to noshing at bars. Restaurateurs say patrons seem especially eager to rub shoulders with one another at the bar, rather than isolate themselves at dining-room tables.” Says fine dining restaurant owner, Chris Douglass (of Icarus in Boston), “People want to socialize and be out; they don’t want to be miserable at home,”. In fact, Chris says he’d like to sell his restaurant or turn into a ‘gastropub’ – a bar with higher quality food.